1. Parents' Repsonse. Children are particularly aware of their parents' worries during a crisis. Parents should admit their concerns to their children, and also stress their abilities to cope with the situation, and the fact that the child is safe. 2. Child's Exposure. How much destruction and/or death the child sees during and after the disaster (this includes personally witnessing and watching television reports). The closer the destruction is (i.e., a friend or family member died, or if the child's preschool was damaged) the greater the chance that the child will experience difficulties. 3. Child's Age. A child's age affects how the child will responD to the disaster. It is important to realize that children will respond differently at all ages and that they all need reassurance that they are safe. Be understanding and talk to your child. Be careful to explain the event in words the child can understand. 4. Helplessness. Children, especially young children, often feel helpless. Helping them to gain some control of the situation will make them feel better. Allowing them to participate in community events, or make projects to send to victims/response workers more directly involved in the event will help. > Refusal to return to preschool and "clinging" behavior, including shadowing the mother or father around the house. > Feeling extremely protective of, or fearful for, the safety of loved ones. > Persistent fears related to the catastrophe (such as fears about being permanently separated from parents). > Recurring thoughts about the event. > Sleep disturbances such as nightmares, screaming during sleep and bedwetting, persisting more than several days after the event. > Loss of concentration and irritability. > Behavior problems, for example, misbehaving in school or at home in ways that are not typical for the child. > Physical complaints (stomachaches, headaches, dizziness) for which a physical cause cannot be found. > Withdrawal from family and friends, sadness, listlessness, decreased activity, and preoccupation with the events of the disaster. > Spontaneously crying of feeling a sense of despair. Displaying of these symptoms after a traumatic event is normal, however, if symptoms presist for more than one month or gets progressively worse, it is possible that the child is experiencing Posttraumatic Stress Disorder (PTSD). In these cases, it may be necessary to seek further assistance for your child from a professional. PTSD can result from experiencing, witnessing, or participating in an overwhelmingly traumatic (frightening) event. This includes prolonged viewing of events on television. PTSD rarely appears during the trauma itself. Though its symptoms can occur soon after the event, the disorder can surface several months or even years after the initial trauma. Below is a list of additional resources available online. NOTE: Some links are to sites outside of the UC domain. No endorsement is intended of products, services, or information, nor is criticism implied of similar sites that are not mentioned. A fact sheet with tips for adults on how to help children and adolescents deal with national tragedies published by the National Association of School Pshychologists. Talking to children about tragedies and other new events. 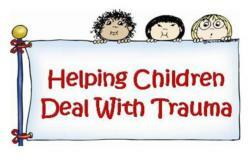 This site contains helpful suggestions for parents to help children deal with disaster and trauma. Developed by the University of Illinois Cooperative Extension Service, this is a set of resources for teachers and other child care or youth workers that helps prepare them for working with children who have been through a disaster. Developed by National Association for the Education of Young Children (NAEYC), this website lists online resources to provide information on how to help when disaster strikes. The Center for Disease Control and Prevention has developed a website to help children cope during crisis and loss. Advice for adolescents and young adults, as well as parents, on recognizing symptoms of grief, accepting loss, and getting help. FEMA's children's website teaches kids how to be prepared for disasters and about causes of disasters. There are games, quizzes, stories, and children can become a "Disaster Action Kid". Also available in Spanish, this fact sheet discusses the effects of natural disasters or traumatic events on children, describing signs of stress at various ages. Suggestions and thoughts from Fred Rogers (Mr. Rogers). The emotional impact of traumatic events can have devasting effects on the mental well-being of individuals of all ages. This resource provides information and referrals to help individuals who experience a tragic event cope with their own mental health needs as well as that of families and others in their care. "When a large-scale tragedy occurs, it can cause strong and deeply felt reactions in adults and children. How adults express their emotions will influence the reactions of children and youth. Parents and teachers can help youngsters manage their feelings by both modeling healthy coping strategies themselves and closely monitoring their own emotional state of the children in their care." PrepareRespondRecover.com covers children's needs with a section developed in collaboration with Dr. Karen DeBord, Extension Specialist, North Carolina State University. It is painfully difficult to talk with children about war. Family Education Network provides general guidelines to follow when talking to children about war. Articles by Judith Myers-Walls, Extension Specialist, Purdue University. This site provides useful tips on talking with children about what they see on TV. It provides practical tips on how to help your children understand the news. This website offers suggestions for helping children cope with a specific tragedy.